If you've been following along you know I'm in the middle of a master bedroom makeover. As DIYers 2IYers, Stephanie and I made the upholstered headboard and covered it with a drop cloth. We used a 12x15 size and had half of it leftover. I am planning to also make a bench for the end of the bed and cover it with the drop cloth and upholster it with the same nail head trim to pull the look altogether. In the meantime, I've been looking at the bed -- which I mostly love -- and trying to figure out just what's missing. Turns out it's the bed skirt. That's when it dawned on me to just use the very same drop cloth. A drop cloth is perfect because it's large, inexpensive, and it gives you the linen/canvas look without the price of actual linen. $209! That's $50 more than it cost me to make the headboard and the bed skirt. I measured the distance from between where the mattress and boxspring meet and the floor and added about six inches (this will be used to "stuff" between the mattress and box spring). I measured the length of the bed and added another three or four inches. You are adding the extra so it can make the turn around the end of the bed. See hems at my knees and at the bottom of pic? Lay out the drop cloth on a flat surface and sit so you have a hemmed edge to your right and at your feet. It's likely the drop cloth is so long that you won't have a hemmed edge on the left and that's okay. Take the first measurement (mattress to floor) and measure that distance up from the bottom edge to know where to cut. Now, starting with the right hemmed side, simply cut a straight line the length of the bed plus the three inches. Again, the drop cloth will probably be longer than the piece you need which will mean you only have a hemmed edge on the bottom and right side. Iron the piece of drop cloth bedskirt so it's nice and crisp. 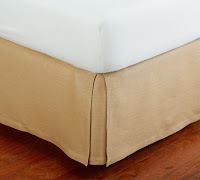 Start putting you bed skirt between the mattress and box spring by putting the short hemmed edge on the headboard side -- this will leave the unfinished edge at the end of the bed (see above). Now you can either just tuck it in between there neatly (the six extra inches will keep it held in place) or you can do what I did and add a little bit of sticky back velcro every foot or so to keep it in place. Now that you have one side of your bed skirt done do the same for the other side of the bed. Just make sure the hem of the drop cloth side is on the bottom and on the left this time so it can be next to the headboard. For the end of the bed do the same type of measurements. When you lay out the drop cloth be sure there is a hem at the bottom and on one side. It's very likely the drop cloth won't be the exact width of your bed so you will have to fold the raw edge under. You can either iron it and use a piece of fabric tape (or another piece of velcro would even work) to keep it in place or sew a straight stitch to keep it neat. And there you have it -- a great looking drop cloth DIY bed skirt! I told you it was super easy and I love that it matches my drop cloth headboard. And doesn't the bed look way more 'finished' than without the bed skirt? 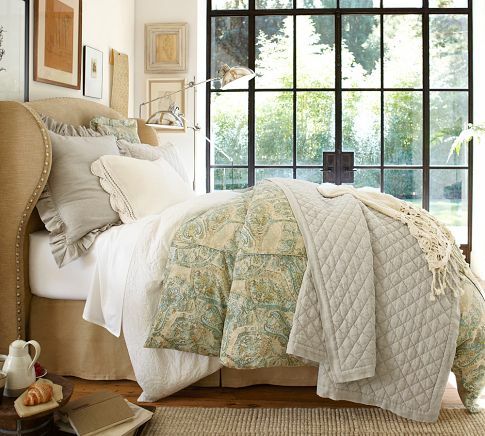 And just for the heck of it...here's another look at how similar ours is to Pottery Barn's $200+ linen bed skirt. We'd love to hear how you've used drop clothes around the house - other than to paint! Please drop us a comment below and add a link so we can check them out! I love it! I have been looking for an inexpensive bed skirt. Thanks so much for the tutorial! Glad you found us! Just this week I actually went back to my drop cloth and used upholstery twist pins to replace the velcro. They seem to be doing the trick.